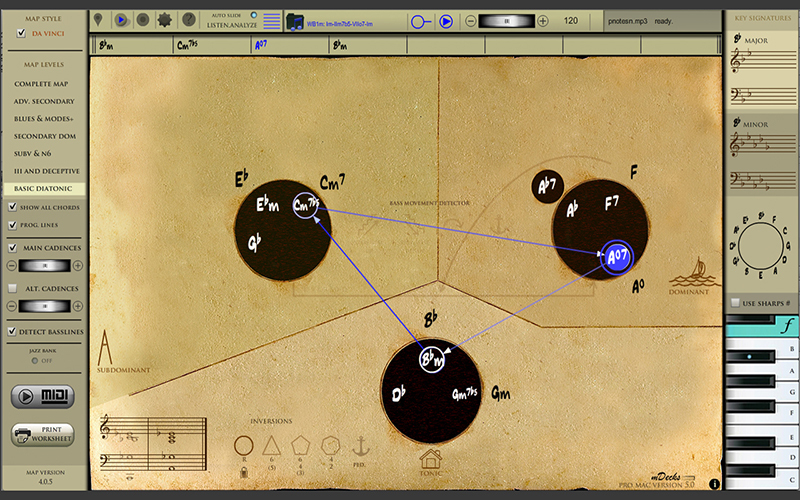 Mapping Tonal Harmony Pro has been envisioned as auxiliary material in the study of Tonal Harmony. 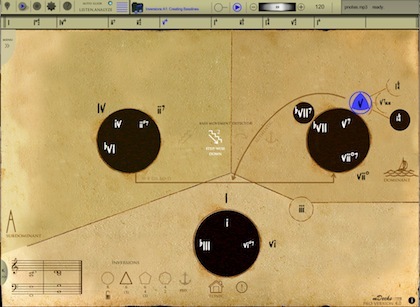 The main objective of this app is to provide the student, teachers, composers and/or songwriters with a tool that will aid them in hearing, analyzing, foreseeing and composing harmonic progressions without struggle, in all keys alike. 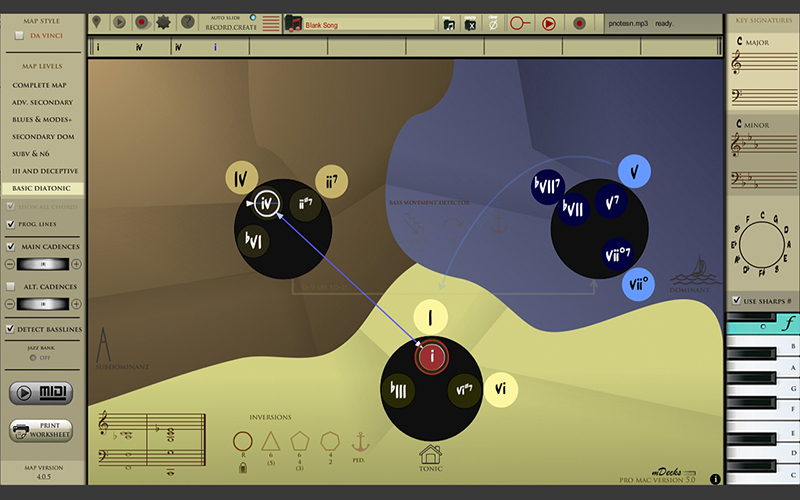 The map has seven levels of complexity, from the basic diatonic neighborhood advanced secondary functions in major and minor modes and is viewable in all 12 keys and enharmonic spellings, plus a functional view (relative to the tonic). Each level is also accompanied by its respective workbook available at mDecks.com for further study and research. Browse Mode - Tap the chords on the map, listen and view the respective function, most-often-used mode/scale. Rec Mode - Create your own progressions and save them for future study or reference. 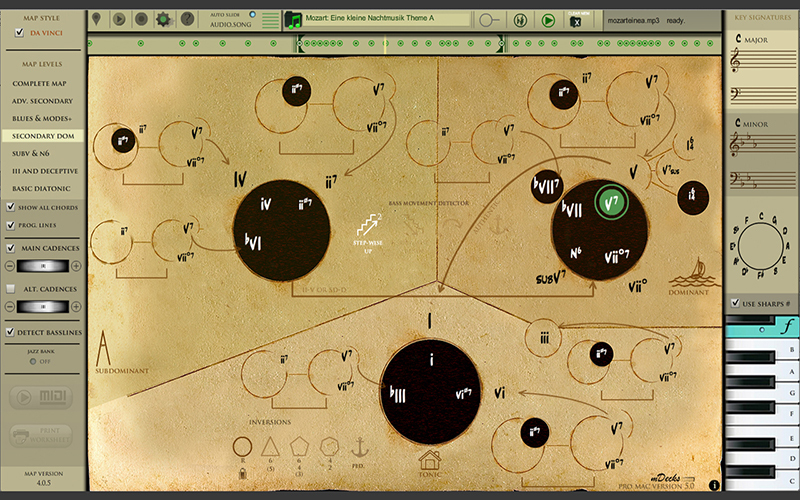 Audio Mode Demo - Load and listen to pieces in the public domain while viewing them in the map. Help Mode - An interactive help mode on how to use the app. 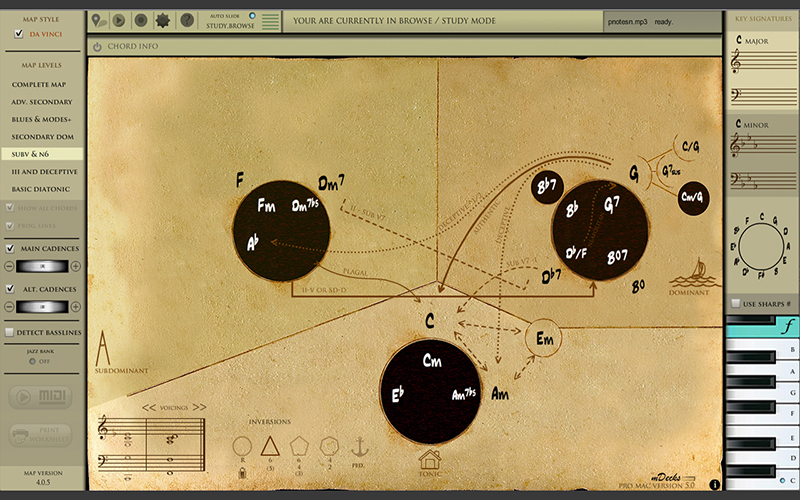 Tap on the chords in the map and view info about their function, mode scale, etc. Activate the cadences paths to make most common paths between functions. Modulate to any key and view the progressions in the selected key or functionally. Select enharmonic spellings using sharps or flats. Transpose any progression to any key by tapping on the keyboard. View the current progression in the staff panel in standard chord notation instantaneously transposed to the selected key or functionally. In play mode you can tap on the chords in the staff to play it and find it on the map. In rec mode double tap to delete the chord or tap an empty spot to insert a chord by tapping them on the map. Make paths in the current progression visible to view the entire harmonic progression. Many new features in this version! AUDIO HARMONIC MARKERS - audio tracks now show functional markers on a timeline to analyze and understand the harmonic rhythm in the current piece. 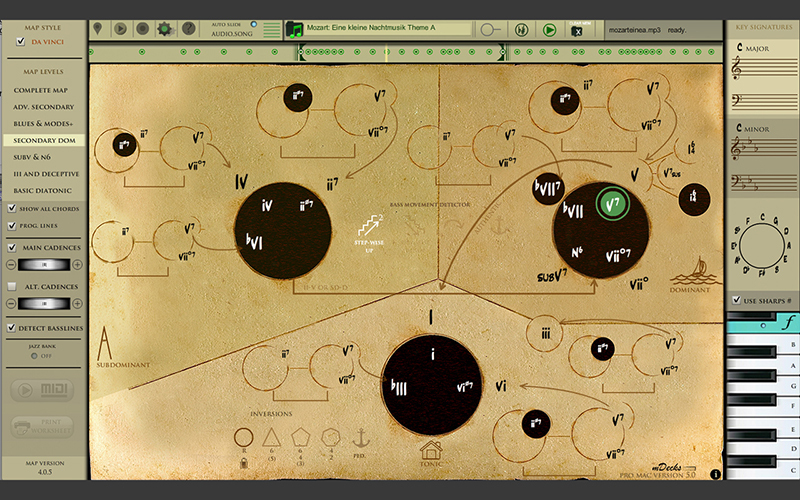 AUDIO ONION SKIN MARKERS - you can now select a section of the audio track you want to view, listen and analyze. KEY SIGNATURES AND CIRCLE OF FIFTHS - app shows the circle of fifths in the current key and the key signature for both major and minor. MENU AND KEYBOARD ALWAYS VISIBLE - menu and keyboard do not auto-hide they stay available all the time.